(April 10th, 2019, Springfield, Illinois) – Illinois Senators passed SB 1510, a bill to stop short staffing at nursing homes and require greater accountability and transparency from the nursing home industry. “Seniors and residents deserve to live and receive quality nursing care in a safe and secure environment. “Nursing home workers who deliver quality care also deserve a responsible and fair workplace that respects our workforce and doesn’t overburden or abuse workers because of short staffing. 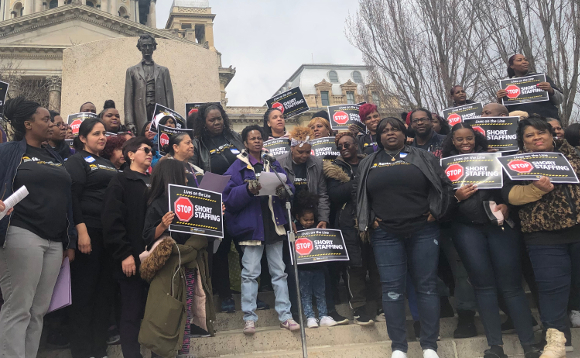 “Seniors and caregivers, together, forged a strong consensus that the nursing home industry in Illinois needs to be held accountable for the crisis of short staffing. This legislation finally enforces the safe staffing law passed by the legislature in 2010 after news reports and investigations revealed rampant cases of neglect and abuse in Illinois nursing homes. “We thank Senator Jacqueline Collins, the chief sponsor of this bill, for her tenacity and commitment to this issue of protecting seniors and nursing home workers. We also acknowledge and thank all the members of the State Senate who voted for this vital enforcement bill and who stood up to the nursing home industry who fought us every step of the way. “We call on the House to urgently take up this legislation, which is sponsored by Representative Anna Moeller, and quickly move this bill forward. “Today’s vote is a major victory for nursing home workers who attended lobby days, held rallies, made phone calls, and visited with lawmakers in their offices. “Even though the nursing home industry is powerful, working together with coalition partners such as AARP Illinois, workers raised their voices, told personal stories of what it’s like to work exhausted because of short staffing, and shaped this debate about the need to put patient care over the industry’s bottom line and the industry’s resistance to reform. “The nursing home industry fears accountability and transparency more than anything. But this new legislation penalizes the industry for failing to provide adequate staffing and creates more sunlight and public scrutiny.